We all know the iconic Cinderella castle at Disney World (and its companion Sleeping Beauty Castle in Disneyland). It’s the most recognizable Disney icon after Mickey Mouse! Chief designer Herbert Ryman based his designs for these princessworthy castles on several real ones throughout Europe. It’s now owned by chocolate magnates. The original owner, Thomas Bohier, bought the site of an old mill and set about converting it into a grand residence. Since he was largely absent from home due to his work, it fell to his wife, Katherine, to supervise and design the chateau. 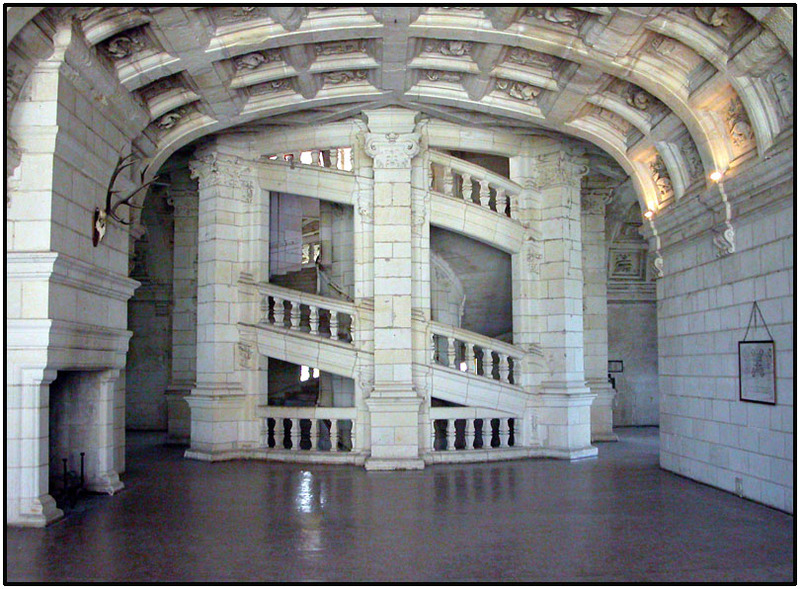 She added numerous towers to use as bathrooms and storage, a shockingly innovative straight staircase (rather than a circular one, as was traditional), and an interior hallway from which rooms opened, rather than room after room simply leading into each other. King Francis I lost no time in seizing this chateau for the crown as soon as the family fell into financial difficulties. Diane de Poitiers (mistress of Henri II) was given the chateau later in the century, and began work on the arches spanning the river Cher, still the chateau’s most famous feature. Catherine de Médicis (wife of Henri II), evicted Diane (go, wives!) 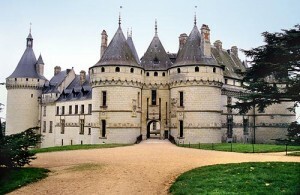 and compelled her to trade this Château in return for Chaumont (a lesser residence). The distinctive arches were completed during Catherine’s tenure as chatelaine. Mary, Queen of Scots, child bride of François II, also spent one spring and summer here after her husband’s early death. 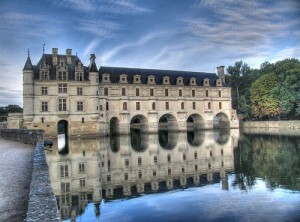 Louise of Lorraine, the wife of Henry III, inherited Chenonceau upon the death of the queen mother in 1587. Upon her husband’s death, she wore only white (the color of royal mourning) gave her fortune to charity, and painted her bedroom black, covering the walls with feathers, bones, and silver gravedigger’s instruments. After her death, it remained empty for over a hundred years. Voltaire, Montesquieu and Rousseau all frequented the chateau during its restoration in 1733, while it was owned by Madame Dupin, hostess of famed salons where artists, authors, philosophers, and the nobility met to discuss intellectual and spiritual matters. She saved the chateau from certain destruction during the French Revolution by allowing full access to the chateau to all people, as it was the only bridge across the River Cher. During WWII, the castle’s main entrance was on occupied territory, and the south entrance was in the free zone. The French Resistance made good use of this situation! The middle section’s roofline was the inspiration for the castle in Beauty and the Beast. Francis I, future seizer of Chenonceau (see above), brought Leonardo da Vinci to France for three years to work on an unrelated castle project. 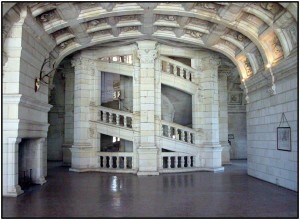 It is highly likely that that Da Vinci also completed the plans for Chambord during this period before he died in 1519. The château was built as a hunting lodge for the king (like the much-later Versailles – what is it with these kings and their extravagant hunting lodges?). Since it was never intended to act as a true fortress, most of the “defensive” elements of a normal castle – the moat, towers, and limestone-facaded walls, are purely decorative. Sounds a little like Cinderella’s castle already! Two people could travel around at the same time without ever meeting each other. 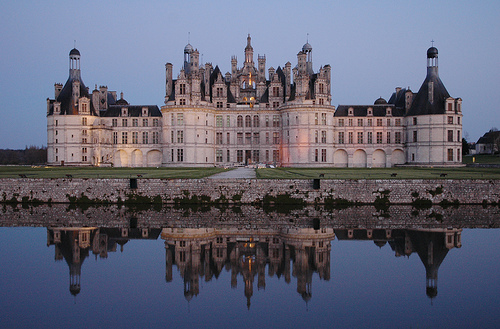 After all the thought, trouble, and expense poured into Chambord, the king and his 2000 person entourage spent a total of about 70 days here during his entire reign. The castle was not practical for permanent residency – it was cold and unheatable despite the nearly 400 fireplaces – and everything from wall tapestries to kitchen equipment to the very beds everyone slept in had to be carried to and from for each separate visit. This situation was relatively common – most furniture of the time was designed to be knocked down for transportation. However, what WAS unusual was that this castle was not situated near a village or estate to provide supplies. Each and every item or person required had to come a great distance, save the game caught during hunting excursions. Very rarely did a visit here last over just a few days. Work continued on the castle sporadically until the reign of Louis XIV (Marie Antoinette’s “Grandpa King”). His grand addition was a stable that could accommodate 1200 horses. Poor local wildlife! They didn’t stand a chance! The castle came near to being demolished during the French Revolution – and in 1793, anything moveable here was sold or otherwise disposed of. In the period immediately preceding WWII, the government evacuated the collections of the Louvre and the Compiègne to Chambord for safekeeping – including the famous damsels the Mona Lisa and the Venus De Milo! Though saved from the German onslaught, they had a close call whan an American B-24 bomber crashed on the grounds in 1944. You’ll be shocked at the number of shelves this occupies! This is the Dewey Decimal System’s classification for “folklore.” So what is folklore, exactly? Take yourself into the children’s section for this project… Often, as in my local branch, librarians will segregate this entire classification, since there are so many titles within it that they warrant a whole wall of shelving! 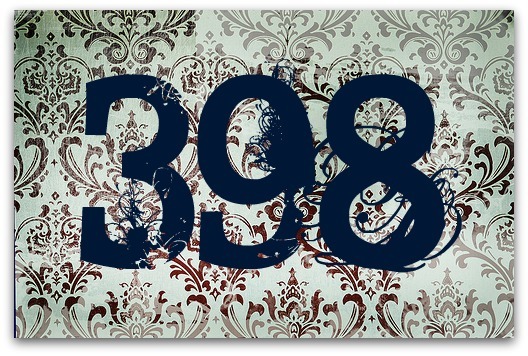 You’ll be amazed at what you might find… for example, over thirty Cinderellas (398.2, as I recall) caught my eye before I lost count! Then, if you like, cruise back through the grown-up section of the library, using the same number, for some analysis and historical works of a more serious nature. Its seizure was an unintended consequence of the American Revolution. This strategic location, home to fortifications since the 10th century, became the home of the Chateau de Chaumont in 1475. More of a fortress than the previous chateaux due to its earlier construction, the fourth wall of this castle was taken down to improve its view of the valley in 1750. Le Ray, no aristocrat, had made enormous fortunes in shipping, and became widely respected for his daring and business acumen. Louis XVI (Marie Antoinette’s husband) appointed Jacques a member of his council and he quickly became one of the king’s chief advisors in commercial matters. After the signing of the Declaration of Independence, emissaries (including including such notables as Benjamin Franklin, John Adams, and the Marquis de Lafayette) were sent to France to seek assistance from King Louis XVI. Le Ray acted as an advocate for their cause, ultimately playing a large role in the critical French decision to become involved on the American side of the war. 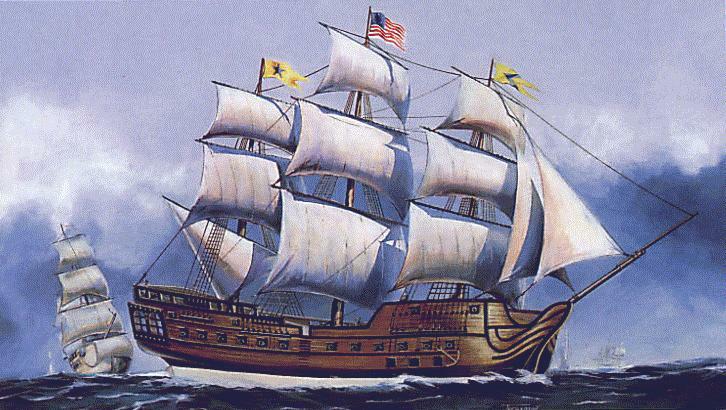 America would not have won the Revolutionary War without France’s financial and military aid. Benjamin Franklin is often credited with obtaining that critical aid from the French king. However, it was Le Ray who funneled huge amounts of cash his way, enabling Franklin to purchase weapons, clothing, and supplies. Le Ray commissioned the construction of the warship “USS Bonhomme Richard” (An homage to Benjamin Franklin’s pen name, “Poor Richard”) at his own expense, and gave it to the Americans to assist in the fight. The USS Bonhomme Richard -given to the US by a sympathetic Frenchman. The political ideals of liberty and equality of all men that Jacques has espoused turned against him (and the king and queen, famously.) The massive financial aid that he had helped convince King Louis XVI to supply led to the bankruptcy of the French government. To compound the matter, drought caused a severe famine in France and the French Treasury had no more money available to subsidize the cost of flour for bread to prevent thousands of people from starving. In 1789, in a semi-ironic twist of fate, the French Revolutionary government seized the Chateau Chaumont. Fascinating! I had no idea there were so many versions of the Cinderella story. I’d heard the Chinese version but I didn’t know there was an Egyptian one. I visited Neuschwannstein (or however you spell it) on a school trip in 1995 and it was incredible! Highlights for teenage me included the weird fake cave complete with stalactites in the King’s bedroom and the wobbly footbridge over a huge drop to the valley below. Also the fact that based on portraits we saw my then boyfriend was the spitting image of the mad king at the same age. We have to wonder, is that why he was a “then boyfriend” and not a “now”? 🙂 That would be kind of freaky!